This Wednesday, I really wish I had long nails. Pretty much ever since I started painting my nails, I have preferred to keep my nails short and square, but within the last 2 months I have been envious of anyone with longer talons (especially natural ones). 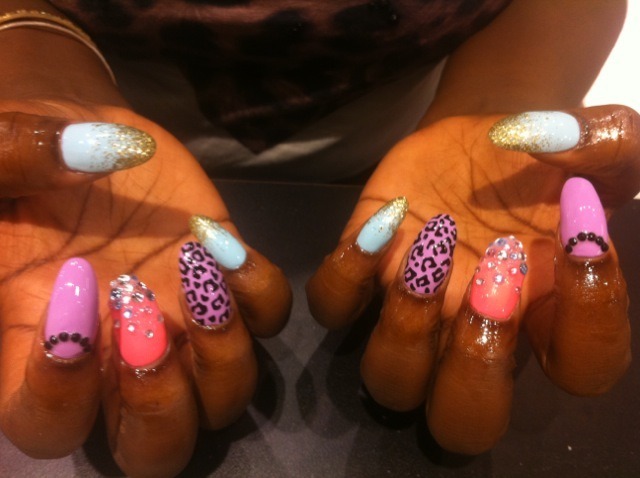 I also LOVE Kate's (from This Is What I do) nails, I can't believe they are real! Working as a VM means constantly moving stuff around, picking up hangers, etc etc, so inevitably my nails are always breaking and splitting. Plus, my naked nails make me feel really quite sick, so I always have nail varnish on, and it becomes a vicious circle. So, I have been on a bit of a mission to grow my nails recently, and so far I've tried two products. First I bought the Boots Salon Nail Growth Activator, after debating the millions of products on offer in Boots, I think in the end I went for it simply because it was the cheapest! To be honest, I was pretty disappointed with it, like I said I think my job is a big factor in why my nails break a lot, but it just chipped so quickly, and after a week there was no visible improvement at all, so I gave up. One of the friends who I live with then gave me Sally Hansen: Maximum Growth. Unfortunately, I can't really do a fair review on this product, as the one I have acquired is quite old and the product is gloopy, making it hard to add a layer every day as suggested on the packaging. Despite this I definitely noticed an improvement in both the length and strength of my nails, so I think I'm going to invest in a Sally Hansen product. On the Sally Hansen website they have a 'Nail Clinic' feature which diagnoses your problem nails by posing a few questions, and then suggests products to help. Apparently I have Weak nails, which I think is a fair analysis, and I'm gonna try at least a few of the products suggested and do a before and after comparison. If anyone knows of any miracle cures please tell me!